Ofgem have published data on the number of customers switching energy suppliers in 2016. 7.7 million gas or electricity switches were done in the UK last year. That’s a rise of 26%. Interestingly the number of switches to small and medium-sized companies was 47%. Perhaps a reflection of people’s growing distrust of the bigger companies. There’s still a huge amount of people that can benefit from switching. The 7.7 million figure doesn’t mean 7.7 million households switched. Some people will have switched more than once in a year. Plus many of the switches will be dual fuel customers. How much do you pay at the moment? According to Ofgem here are details of the cheapest duel fuel as of the end of January 2017. If you’ve never switched energy supplier before, you need to get in the habit of always checking whether it is worth you doing it. It can save you a lot of money. These days it is a lot quicker and easier than it used to be. Most switches now take 21 days to complete, three years ago the average you to be 5-weeks. You don’t have to switch both gas and electricity if you don’t want to, you can just do one of them. Remember to always plan ahead and check prices ahead of your current tariff expiring. Whilst you do it why not make it part of an overall effort to reduce living expenses, now is a good time to do it. 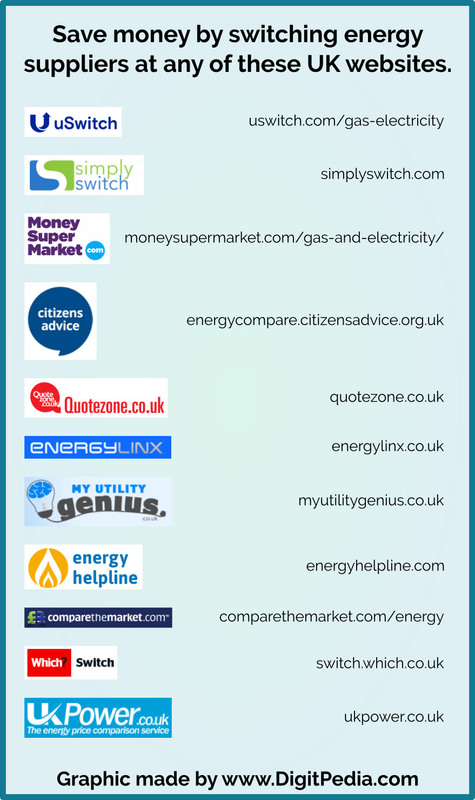 There is a good choice of websites that you can get the best prices from for switching your energy supplier. 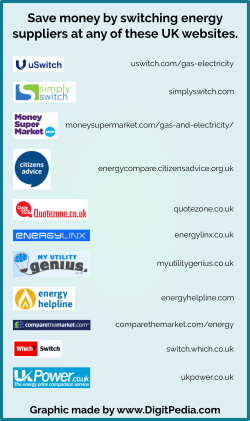 Here is a graphic I’ve made of some of the UK sites that can help you, including uSwitch, CompareTheMarket and Simply Switch. The companies listed are in no particular order. Click on it for full-size. Save yourself some money, tell your friends and family how to do it as well, and let’s get everyone bringing down their household bills!